Most examples of the Munich style in the United States date from after the turn of the century, but the windows at Saint James Church are remarkably early, due to the personal connection one of its founding members had with the homeland. Gustav Schwab, son of the great German poet and scholar of the same name, was the American agent for the North German Lloyd Steamship Line and settled in the Bronx in the 1850s. His home is the present site of the Bronx Community College (formerly the NYU campus). Schwab joined the parish of Saint James in 1858. When the present church was built in 1864-1865, Schwab endowed it a set of four superb windows from the Royal Bavarian establishment. Schwab was also a benefactor of numerous other New York institutions, including the "German Hospital" — now Lenox Hill Hospital — and was very active in civic affairs. To Saint James Church he was an honored member and leader, and when he died in 1888, Saint James honored his memory with an exceptional early example of the stained glass work of Louis C. Tiffany: The Last Supper. The windows that Schwab commissioned for the church sanctuary portrayed the four evangelists, the Patron Saint James together with an angel holding the sword as a symbol of his martyrdom, and a window portraying the healing of the man by the Jerusalem Temple's Beautiful Gate (Acts 3). 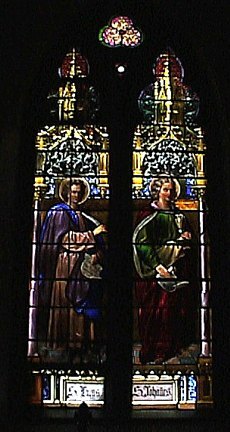 This latter window is a memorial to another Saint James member of note, Dr. George P. Cammann, the inventor of the modern binaural stethescope — an invention for which he refused to secure a patent on the grounds that the contribution made to science and health was more than ample compensation.